Hi everyone and welcome! It's Cec Wintonyk's turn to host the latest challenge over on the Frilly and Funkie Challenge blog and given that weddings are the focus this time she's called it 'With This Ring'. Cec challenges us to create vintage or shabby chic projects that celebrate the big day. Your creation might be a card, a gift, a decor item or something to keep the memories of the special occasion. As luck would have it there is a wedding in our family this year so I've taken the opportunity to create something bespoke - using Eileen Hull's HeARTfelt 'Journal' I've created a Guest Book with plenty of room for everyone attending the celebrations to record a message for the happy couple. Here are the signature inserts, crisp, white, and ready for all those lovely messages to be recorded for posterity. There have already been questions about how the flowers came together so here's the full tutorial. Step 1 - Apply Texture Paste through the Ornate stencil over the front and back covers of the journal. Step 2 - Join the front and back covers together with strong adhesive down the centre of the spine. Step 3 - Stick the closure tab onto the centre back cover along the longest side. Step 4 - Stick a plaque from the die set onto the upper centre of the front cover. Step 5 - Cover the insides and outsides of the journal with a layer of white gesso. Step 6 - Cover the journal with Picket Fence Distress Paint on the insides and outsides. Step 7 - Highly dilute Hickory Smoke Distress Paint with water and apply a wash over the whole of the journal, dabbing away the excess to accentuate the stencilled patterns. Step 8 - Dab white gesso onto both sides of a piece of watercolour card randomly with a wet wipe. Step 9 - Apply Spun Sugar Distress Spray Stain over both sides of the card and dry completely. Step 10 - Repeat Step 9 with Tattered Rose Distress Spray Stain. Step 11 - Cut small flowers, in threes, from the card using the Tattered Florals dies. Shape with a ball tool or similar as shown in the picture. Glue the tightest flower inside the slightly looser flower, then glue onto the open flower and allow to dry. 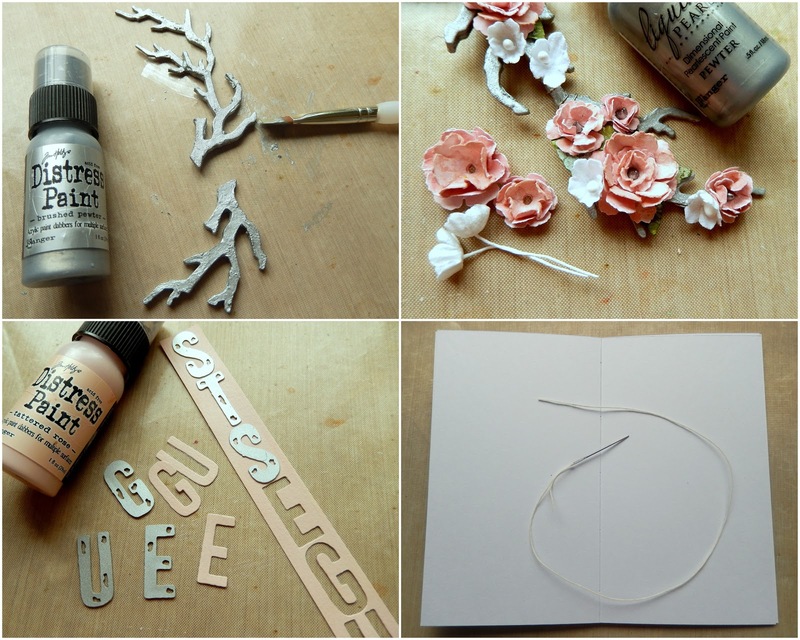 Step 12 - Cut branches from card, layer together to form longer and thicker branches. Cover in a layer of Brushed Pewter Distress Paint. I wound thin silver wire around them at this stage. Step 14 - Paint card with Tattered Rose Distress Paint and cut letters using the Alphanumeric Marquee Thinlits dies. Stick onto the plaque on the front of the journal. Step 15 - Cut pages from watercolour card and white Sizzix Paper Leather (for the signature covers) 19cm x 22 cm, fold along the centre of the longest side and stitch together with waxed thread. To finish I ran 2mm white elastic cord through the journal spine as directed on the instructions that come with the die. The three stitched signatures were secured through the elastic strands. I also tied seam binding, coloured with Tattered Rose Distress Paint, though the centre of the spine and through the closure tab. That's it for my DT project for the current Frilly and Funkie challenge 'With This Ring' I hope you've enjoyed today's tutorial. Do make sure you hop on over to see what my talented team mates have been inspired to create. And remember to link your own wedding/romantic themed shabby chic or vintage projects, to be in with a chance of winning one of the fabulous prizes. Absolutely stunning, love your journal! Wow, Jenny! This is magnificent! I love the way the pretty pink flowers cascade down the side of the album. The stenciled background is so soft and shabby with amazing texture and shadow. What a lovely wedding gift! Jenny, this is just soooo pretty! I love your colors and those flowers are lovely, arranged on those silver branches. 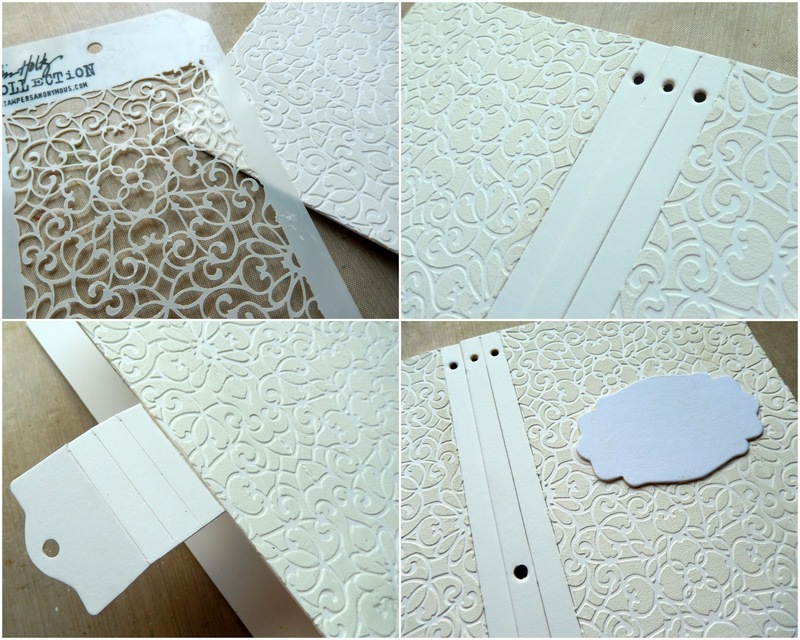 The stenciling on the covers is just so elegant--what a wonderful wedding guest book! Someone is going to be very happy to receive this! You are such an inspiration! Hugs! So beautiful and such a lovely keepsake for the bride and groom. Having little notes from their guests is special in itself but to have them in such a special journal created especially for them with love is even more special. The texture sets off the gorgeous flower spray so nicely. The texture paste through that stencil is beautiful! The flowers are gorgeous, too. I like that it isn't loaded down with too many details. Very elegant. Hi Jenny, back off my travels, this is absolutely gorgeous! I love the textured background and stunning flowers. I hope you are well. Absolutely gorgeous Jenny!! Your flowers are fabulous -- I love them. What a fantastic idea and your guest book will be cherished for a life time! Gorgeous Jenny - great tutorial, too! Those flowers are stunning and so perfect for a wedding arrangement! The texture on your journal is fabulous! I can never get clean impressions from my stencil and yours look wow! Utterly lovely, Jenny. This will have the guests lining up to leave their messages. I adore the subtle distressing of the textured background (Hickory Smoke is a magical colour! ), and the spray of flowers is just glorious. Hope you all have a wonderful day at the wedding when it comes. Now this is Special! Jenny , very Special and so so classy. 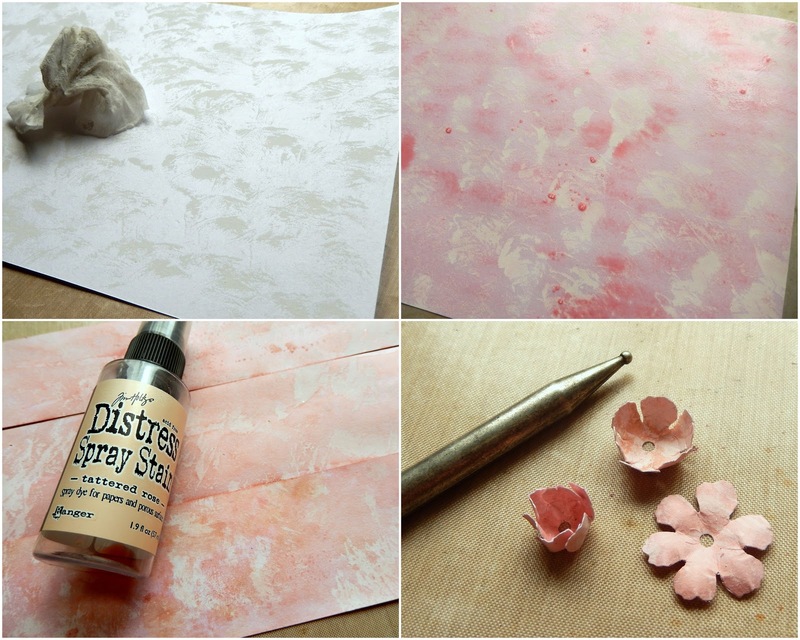 The textured stenciling is fabulous and oh my your spray of flowers - exquisite ! I'm sure this will be a very treasured memory of the bride and grooms special day .